OH HAPPY DAY my friends!! Hope that you all had a wonderful weekend!! We had an eventful few days. A close friend had a shower, my two oldest had their homecoming dance, and I hosted our first local Style Collective meet up. I just want to have an easy Monday. HA!! 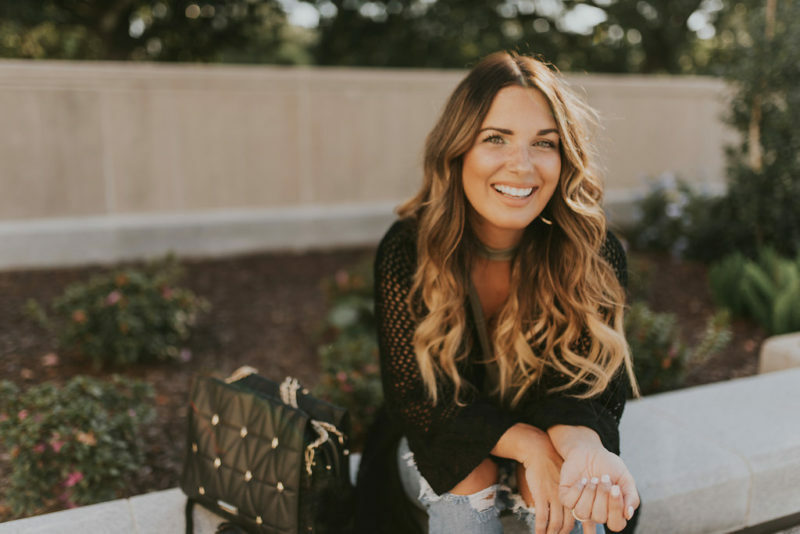 When it comes to being a busy mom who still likes to look cute, I need outfit options that are wrinkle free, comfortable, and versatile. So, my go-to, easy outfit for the fall and winter is jeans, a cute tee, a neutral cardigan, and my white chucks. 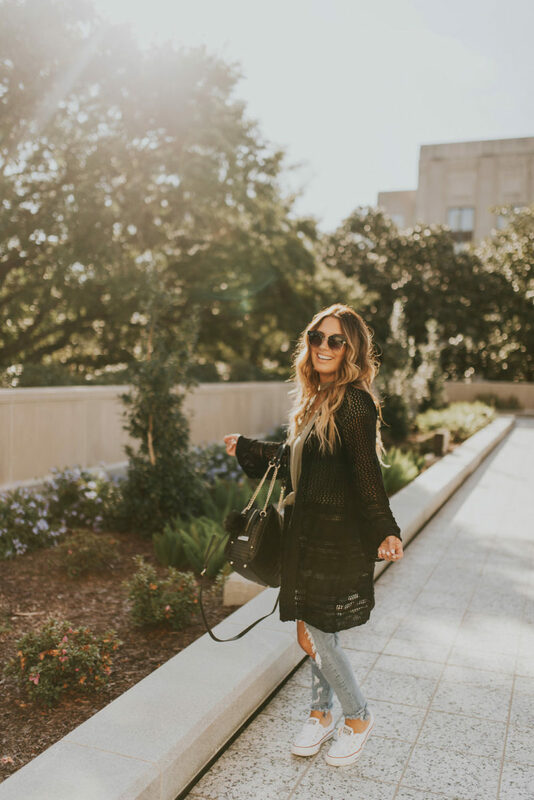 When I was shopping on SOUTHERN GRACE’s website, my eyes were drawn to this open knit, black CARDIGAN that is under $45. It is a must-have for fall and winter. It’s casual enough to pair with a tee and jeans but classy enough to pair with a dress and heels. It also comes in a rust color that is lovely too. Seriously, I could wear a cardigan every day of the entire year. Make sure to check out some of their cardigan options: HERE. What are some favorite outfit options of yours?? Oversized sweaters, loose tops, sweatshirts, tunics, and flow-y cardigans are all my jam. I just have to add a good pair of jeans and my white chucks. Thanks to SOUTHERN GRACE for sponsoring this post. All thoughts and opinions are 100% my own. Such a chic cardigan! I love it! and the sneakers paired with it are perfect! Fall and winter are all about the cozy cardigans! What a gorgeous outfit! That cardigan is perfection!! I love the cardigan! It looks like the perfect versatile one for every day and even a night out. 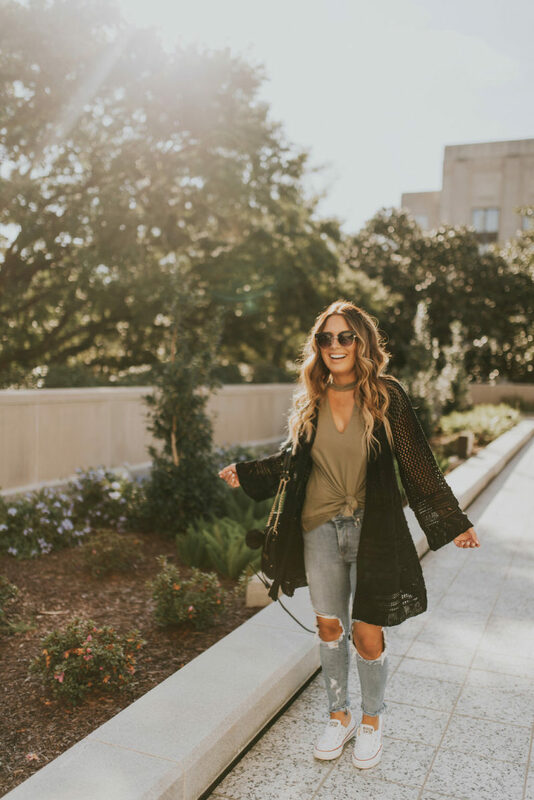 That is the cutest cardigan and perfect for fall in the south! I love your jeans, too! Your autumn style seriously couldn’t be any more perfect. I’m crazy about this entire look – especially that fun cardigan. I love that it’s sheer but still functional. Totally cute! Those sleeves! This is the perfect lightweight layering piece! Comfy but yet so adorable on you! The light in these photos are stunning!! I love this entire look! That cardi is so fun!! You are so cute!! I love this casual, chic outfit! This cardigan is sooo cute! Love how you styled this look. You are GORGEOUS by the way. Such a cute outfit girl! Love that you knotted the tee, and that distressed denim is my fave! This cardigan actually gives me life! I feel like you could make it work with so many outfits. 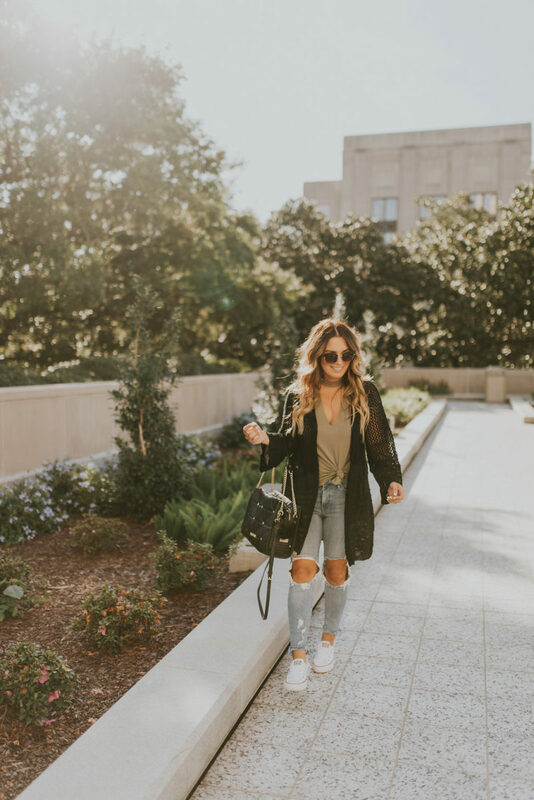 I am crazy for just about any cardigan but one that can stretch seasons are my faves! 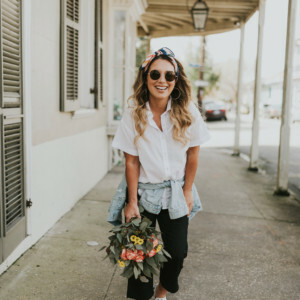 This entire look is adorable! Need that cardigan in my life!